When Hitler invaded the Soviet Union in June 1941 he had not thought it necessary to inform his ally Italy of his plans. Despite this slight, Mussolini wasted no time in declaring war on the Soviets, and determined to send troops to the front, worrying only that the Germans would achieve victory before the Italians could get there. The huge distances involved caused many problems for what was to become the Italian Eighth Army, but in late 1942 they found themselves on the left flank of the German Sixth Army as it battled to capture Stalingrad. The Soviet Operation Uranus, launched on 19th November 1942, began the destruction of the invading armies, with both German and allied troops suffering terribly. The Italian contingent, something like 229,000 men, was virtually destroyed as a fighting unit, and the survivors returned to Italy. It had been a disaster, and, along with the loss of North Africa and the Allied invasions of Italy, it was to cost Mussolini the leadership of his country. Throughout the war Italy’s troops suffered from poor supply of what was often inadequate equipment, but once Italian troops were committed to the Russian Front they were given the best of what was available. As with the Germans in the winter of 1941/42, they had suffered greatly from inadequate clothing during the freezing Russian winter. The majority of figures here wear the standard M1934 greatcoat, a single-breasted garment that provided little warmth even in less severe climates such as Yugoslavia. A few look to have a parka or similar, which was better, although it is hard to be sure what they wear. Some of the men have long boots but many have nothing more than short boots and puttees - an archaic form of dress by this period that did little to combat deep snow and roads of mud. Two men have long boots with two straps on them. We do not know what these are - perhaps a misunderstanding of the stiff leather gaiters worn by the artillery and other units - although in fairness one of the men is an officer. Some wear the M1933 steel helmet but this looks to be worn over a cap or balaclava. The caps would mostly have been either the bustina with the ear flaps down, or a better, fleece-lined version which was warmer but similar in shape. All the caps here look accurate, as indeed does all the clothing, which nicely reflects the varied and sometimes improvised appearance of these men during those terrible winter months. Almost everyone here carries a haversack or 'tactical bag', but other kit is very sparse, with only the occasional canteen, gas mask bag or entrenching tool. Ammunition pouches seem to vary greatly, with a few having the typical two-pouch arrangement but others also on display. Of more concern is the fact that many have the 'Y' shaped strap arrangement at the back, which is much like the German system but not the Italian, where the pouch support strap was slung around the back of the neck. There were special pouches (for example for the Alpini) that did have rear straps, but on at least one figure the sculptor has clearly thought the usual arrangement includes these rear straps, which is wrong. Conceivably some German examples could have been adopted as they were a better design, but overall there are far too many here. Some figures also have an ammunition bandolier, which is fine. The chunky Strelets style makes precise identification of weaponry a challenge, but as far as we can tell the men here carry what would be expected - mainly the Mannlicher rifle or carbine and the Beretta submachine gun, both the M1938A and 38/42 models. All these look bad, and in particular the carbine, which the sculptor has correctly given a folding bayonet, although this is so thick and crude that it looks like a double-barrel. The last man in the second row carries a Breda M30 light machine gun, a poor weapon at best made worse in this campaign by the tendency for the oil reservoir to freeze, rendering the weapon useless. All these weapons are appropriate for the battle for Stalingrad, although we were surprised by the high proportion of submachine guns - four of the 13 poses have one. As the sophistication of the subject increases, so the minimum level of detail required also rises. When producing an ancient subject the Strelets sculpting can to some extent get away with chunky detail and somewhat crude proportions, but by the time you get to World War Two subjects the shortcomings are far more obvious. 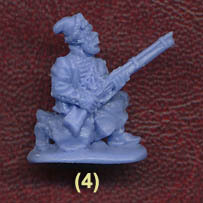 Everyone is familiar with the Strelets style, and the pictures of the figures speak for themselves, so we will just say that they look pretty terrible when compared to recent World War II sets made by other manufacturers such as Zvezda, Caesar and Waterloo 1815. There is no flash however, nor any excess plastic, thanks in part to the poses, which are quite flat but no more so than many other sets. The choice of poses is reasonable, and while it would be easy to think of many more that could be done these cover the bases pretty well, given that action poses are what most people want. Our unease at some of the straps and the high proportion of submachine guns are our only issues with the research of this set, and with reasonable poses how you react to it is really down to whether you like this style. We felt the figures conveyed the impression of the often poorly clothed soldiers pretty well, so while they are not attractive figures they do at least fill another gap in the plastic figure range for what most consider the pivotal campaign of the Second World War in Europe.